“Discover Wild Portugal” is the fantastic Grand Prize (for two!) in the December draw of the Rewilding Europe Travel Club. An unforgettable five-day trip in the Western Iberia rewilding area, where the Côa river is carving its deep path through the mountains, in and around the Faia Brava reserve! 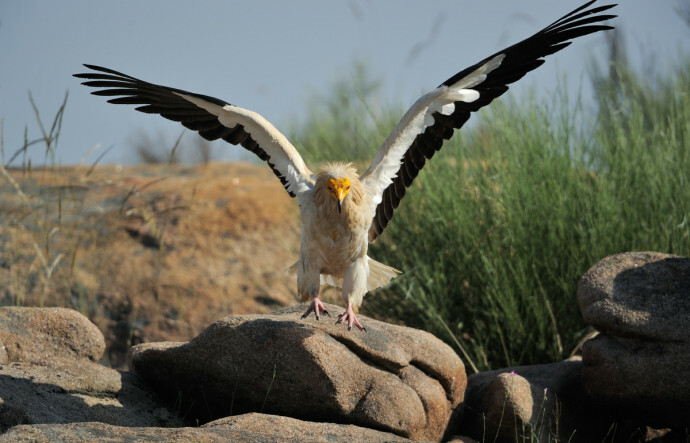 Egyptian vulture, Faia Brava reserve, Côa valley, Portugal. You will be thrilled by the large raptors’ flight and all the surrounding wildlife in the first private protected area in Portugal – the Faia Brava Reserve. Walking through the historical villages and witnessing traces of early human life and wildlife in the Côa Valley Archaeological Park, a UNESCO World Heritage site, with the greatest known open-air collection of Palaeolithic engravings in Europe. Of course, you will also enjoy the world-famous Portuguese hospitality, and be delighted with their amazing wines and gastronomy. But there are more prizes lined up for our members: two trips organised by two members of the European Rewilding Network – Knepp Wildland and WildSweden. The “Kolarbryn Ecolodge wildlife adventure” (for one) is ideal for families, couples and friends who are looking for a ”back-to-nature” and something different from the daily life. With elk-watching and who knows, maybe even hearing one of the local wolf packs howling? And if you are the lucky winner, WildSweden will provide a 20% discount for any other person who wants to join you. You will have plenty of time to explore Swedish nature on your own as well as with the professional wildlife guides from WildSweden. The Knepp Wildland Safaris Holiday (for two!) brings you to one of the largest privately-owned rewilding projects in lowland Europe – 3,500 acres of former intensively farmed arable land in West Sussex, in the south-east of England, where herds of animals like the ancient Exmoor ponies, red deer and fallow deer now roam freely, being the driving forces of habitat generation. The draw is planned for right before Christmas, and we be will announcing the lucky winners on the website and in a special edition of the Travel Club newsletter. The three winners will be connected through individual e-mails to the trip providers. We would like to again express our special gratitude to Associação Transumância e Natureza (Portugal), Knepp Safaris (UK) and WildSweden (Sweden) for providing the fantastic wildlife and nature trips for our December draw. We wish all the Travel Club members the Best of Luck for the draw! If you haven’t yet signed up, please do so here. That will give you the chance to possibly win fantastic nature trips in Europe and also to book special trips with a Travel Club discount!